The Melrose Sevens always ensures exciting action (picture �Fotosport/David Gibson). The world’s original rugby sevens competition – the Melrose Sevens – will be sponsored by Aberdeen Standards Investments in 2019. The deal marks the firm’s continued support for this highlight of the global rugby calendar, having sponsored the event since 2012. The game of Sevens was invented in Melrose in 1883 and the 128th playing of the Aberdeen Standard Investments Melrose Sevens will take place on April 13, 2019 at the town’s Greenyards. There’s also news about a new label this year for the overall King of the Sevens competition, of which Melrose is a major part. Melrose, which has a population of 2500, welcomes 10, 500 visitors annually for the one-day tournament, which is the biggest sporting event in the south of Scotland and the biggest rugby event to take place away from the national stadium, Murrayfield. Martin Gilbert, co-CEO of Aberdeen Standard Investments, said the firm was pleased to continue its support of such a historic and much-loved tournament. For more information and to book tickets, visit www.melrose7s.com. Keep up to date on Facebook at www.facebook.com/melrosevens, Twitter @melrosevens and Instagram @melrosesevens. 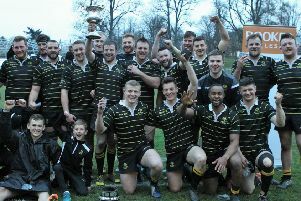 Meanwhile, the Border League has announced that the Kings of the Sevens series, which started for this season at Peebles in August, will be titled ‘The Ned Haig Kings of the Sevens’, supported by Melrose Rugby. This is an agreement for one year, with the option of a second year. As in previous seasons, the event will be held over 10 tournaments, culminating with the Jed-Forest in mid-May.